There are frequently religious references and overtones to Thorn’s songs, such as on “Pimps and Preachers,” the album’s title track. 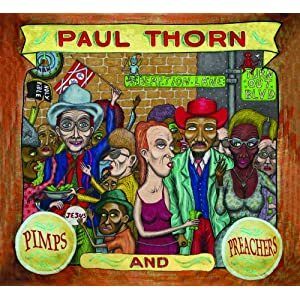 “My Daddy had a Cadillac, my uncle drove a Ford,” he sings, “one was satan’s angel, and one worked for the Lord.” Perhaps that is what I like about Thorn’s music; he has an appreciation for both perspectives and finds the mischievousness middle ground. Thorn’s secret weapon is his band, a crack unit that is one of the most unheralded groups in rock and roll. They deliver a muscular sound, immaculately produced to create a balanced sound. In the end, however, it is Thorn’s infectious optimism that shines the brightest. It’s the perfect elixir for a bad day. As Thorn declares in “You’re Not the Only One” — “Life don’t come with a guarantee, you only get so many heartbeats; it’s such a blessing to be alive, whatever happens I’m satisfied.” Amen. You’d likely never guess that Rich Pagano plays in one of the country’s best Beatles cover bands. Then again, you might when you hear his solo album. It’s chock full of the smart and nuanced pop songwriting that was a hallmark of that other band. While it is easy to get entranced by ballads like “Goodbye Anna,” I’m drawn to this unabashed rock and roll number. Heck, even John and Paul were known to cut loose with a little Chuck Berry or Little Richard now and then. There’s a lot to be said for doing your own thing. After stints with Superdrag and the late, great V-Roys, Mic Harrison has hit his grove with his own brand of satisfying rock and roll. This Austin trio makes quite a racket – and that’s a good thing. Nathan Singleton’s National steel guitar blazes a fiery trail while bandmates pound out a raucous rhythm. LA singer-songwriter James found a spiritual home in Austin Texas. Charlie and Will Sexton, the musical co-conspirators on her latest release, kept the focus where it belonged – on James’ remarkable voice. A stunning mix of honey and smoke, it seems effortless… and immensely enjoyable. Anyone who has seen Borges and crew will attest that they put on a tremendous live show. Now everyone can get a taste with this outstanding Listen closely and you can tell that Borges was battling laryngitis the night the show was recorded. She and the band miss nary a beat, making one appreciate their live chops even more. Yes, it’s the Gordon Lightfoot song. Doucet and crew keep a touch of the easy-going feel but scuff it up enough to make it a garage rock gem. My Jerusalem plays music slightly soulful with instrumentation somewhat symphonic. When you hear singer Jeff Klein’s wail, however, you’ll know that it is entirely rock and roll.